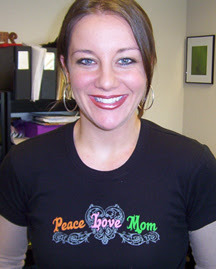 Shannon Holly, Star 94 Traffic Reporter Extraordinaire, LOVES her Peacelovemom shirts! 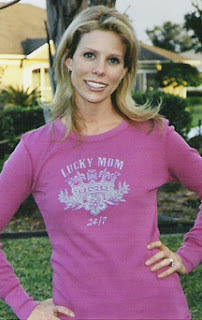 Cheryl Hines, the Emmy® Award nominated actress from "Curb Your Enthusiasm" proudly models her favorite PeaceLoveMom design. “It makes me happy to work. And it makes me a better mother to be a happy person.” says Cheryl Hines, mother to daughter Catherine Rose age 2 1/2. A Special thank you to Cheryl for the picture. We are thrilled to have you join the PeaceLoveMom celebration of Motherhood.